It's that time of year again, and the aquarium thermometers are starting to rise. If this is the first summer your aquarium has seen, or if perhaps you have upgraded the aquarium's lighting since last summer, you might be finding yourself in a predicament - the aquarium is too hot. There are numerous ways to cool an aquarium, they range from the simple and inexpensive, to high tech and pricey options, all depending on how severe the aquarium's heat issue is. Even if your aquarium's temperature is just slightly warmer than optimal, there are a few simple things you can do to bring it down a degree or two. Most aquarium literature will state that marine aquariums should be kept between 75° to 82° F, and this is the range that will be addressed. It is important to understand that each situation is different and the temperature of an aquarium depends on many factors including: the size and shape of the aquarium, the ambient room temperature, the type of lighting, the distance of the lighting from the water's surface, the presence of large water pumps, and the surface water movement of the aquarium. With so many factors affecting water temperature, it may be necessary to "experiment" with various cooling options to find one that works best for your system. Before taking action to counteract a heat related problem, perform a check of your aquarium system and make sure nothing is malfunctioning or incorrectly configured. Is the heater set at the right temperature? Is the thermometer you are basing your aquarium's temperature reading on a high quality device? Many consider the very inexpensive floating glass aquarium thermometers unreliable. It seems that electronic thermometers like those on Ranco controllers are usually accurate. Are the powerheads functioning normally with their output directed properly? One common source of heat in our aquariums is powerful lighting. Accordingly, the light fixture, canopy, or hood where the lighting is located is the "hot spot" that will be discussed first. For this factor, fans that are run on a timer with the lighting and fans that run on temperature controllers which turn them on when the temperature gets too hot are useful. For a strip light fixture resting directly on a glass top, a simple medium-sized tabletop fan mounted so that it blows air across the light fixture may take care of any heat problems. If a tabletop fan can't relieve the heat, raising the strip light up an inch or so by placing small blocks of wood under each end may assist in lowering the temperature. Caution must be used here - the author is making the assumption that most strip lights contain either normal output (NO) fluorescent or compact fluorescent bulbs. If wooden blocks are necessary to permanently prop up the light fixture, they may be painted to match the strip light or the aquarium's trim. I recommend using paint marketed for the exteriors of outdoor cooking grills. This paint can handle high temperatures and, to an extent, exposure to saltwater. 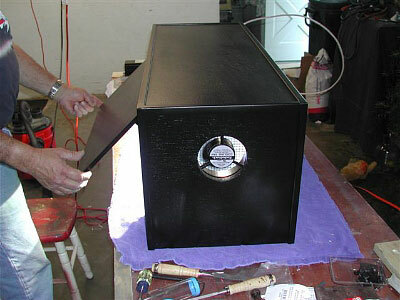 If your aquarium has a wooden hood or canopy that houses the lighting and has a heat problem, there are a few options. Glass tops over tanks reduce the amount of water that can evaporate and thereby increase the temperature of the aquarium. Removing the top may be a quick solution. If there is a concern about the animals jumping out of the aquarium, eggcrate available at hardware stores can be used to cover the top of the aquarium or the open back of the aquarium. If the heat problem isn't being caused by the greenhouse effect, try using fans to ventilate the hood. 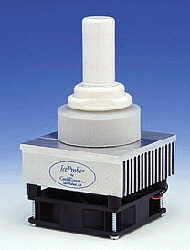 You can find DC (Direct Current) fans (the kind used to cool computers and electronics) and the AC (Alternating Current) adaptors necessary to run them inexpensively from numerous reputable dealers. Computer websites like Xoxide have a large selection of DC fans that work well. Note that attaching one of these fans to an AC adapter will require some electrical knowledge. Direct current fans that move air at speeds of around 85 cfm (cubic feet per minute) are available for around $10, and AC adapters can be found for less than $10. across the metal halide lamps and the water's surface on his 50 gallon reef. Photo courtesy of Andrew Trevor-Jones. Alternating current (AC) fans that move 85 cfm are available from electronics stores such as Radio Shack. The advantage of this kind of fan is that an AC adapter (which takes up a lot of space on a power strip and may be difficult to connect) is not required. The disadvantage of this kind of fan is that it uses more electricity to run than the smaller voltage DC fans. Some aquarists also recycle fans from old appliances or use tabletop fans, depending on how much space they have behind their stand or hood. More important than the type of fan used is the manner in which the fans are positioned. Fans can be used to either blow cool air into a hood or pull cool air into and through the hood (blowing out air that has warmed as it passed through the canopy). Usually, fans are not best applied to pull air through the canopy unless it is nearly sealed except for an inlet for fresh air. This method can be useful, however, when the primary lighting is between the fan and the hole. As an example, the author has a 15 gallon propagation tank that has an 85 cfm fan located at one end of the canopy and five 3/4" vent holes (in a nice symmetrical pattern) on the other side. The canopy is sealed all the way around except for a rectangular cut in the back, which fits perfectly around the filter. Lighting is provided by a single 250 watt metal halide bulb (it didn't seem like overkill at the time!) and two 13 watt actinics. Despite the large wattage on such a small tank, there are no heat problems as the fan gently draws air past the metal halide bulb and out of the canopy. I have heard that temperature variations caused by a lot of air flow on or around a metal halide bulb could be detrimental to its spectral output. Hello Lights, a popular aquarium lighting company, kindly assisted me and researched the issue of air flow on and around the bulb in the IES Reference Manual. The manual stated, "With HID equipment [such as metal halide], temperature variations have practically no effect on light output." In order to affect the light output the arc tube's temperature would have to be changed, and since the arc tube is running at such high temperatures, any ambient temperature variations are negligible. The bottom line: unless you are blowing a huge fan right on the metal halide bulb, you will not affect its function or damage it. of the canopy. Although it is a powerful light on a small aquarium, there are no heat problems. When a fan is used to pull air through a canopy, it is being exposed to a lot of warm, humid and salty air which may reduce its lifespan. It is advisable to check fans used in this type of application frequently to be sure they are not becoming "clogged up" by debris like dust or salt. In canopies with an open back, a fan blowing cool air into the hood will cause heated air to flow out, thus keeping the hood cool. 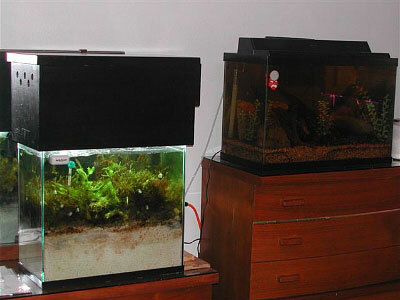 Fans used in this application should be fitted with an intake filter, which is usually made out of a type of synthetic sponge so that dust is not being blown into the aquarium. his 29 gallon aquarium. The fan promotes evaporation, and thus cools the aquarium. Photos courtesy of Marc Levenson. When your coffee, tea, or soup is too hot, you blow on it and it cools it down. The same principle can be applied to an aquarium. Fans may be used to increase evaporation, thereby causing an aquarium to cool down. A fan mounted at an angle or completely horizontal blowing on the water surface can decrease the temperature of the aquarium significantly. Keep in mind that if a lot of water evaporates from the aquarium, the salinity of the water will increase. Since evaporation has such a cooling effect on an aquarium, it is common sense that an aquarium with a small amount of surface area might be more difficult to keep cool. 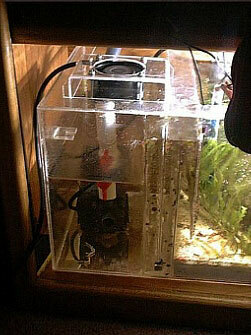 Powerheads can also be used to agitate the water surface of the aquarium and cause evaporation. One final note on fans: an aquarium whose heat is controlled by only one fan may be subject to a catastrophe if it were to fail. I speak from experience! Another inexpensive alternative is an electronic temperature controller. 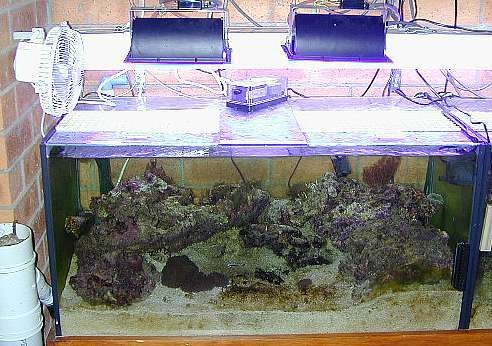 Ranco makes a model that is commonly used with reef tanks. This type of controller can be set to act like a temperature-controlled light switch. When the tank water gets to a preset temperature (let's say 82º F), the controller turns the lights off. After the tank water cools to another preset temperature (let's say 80º F), the controller turns the lights back on. A controller of this type can be an effective backup to fans. The cost of this type controller typically is in the $70-$100 range. The built-in digital thermometer is also a nice feature that can be used as your primary or secondary thermometer. If you've tried using fans and controllers to reduce the temperature of your aquarium to no avail, the next step in aquarium cooling may be required - a thermoelectric chiller. Thermoelectric devices, like air conditioners, are based on "The Peltier Effect." According to EIC Solutions Inc., "It [The Peltier Effect] utilizes two elements of a semi-conductor which is constructed from doped Bismuth Telluride. Upon application of a direct current (DC) power source, these devices generate a cooling action, countered by a generation of heat on the opposite side of the device." Although aquarium thermoelectric chillers may function slightly different than the products by EIC, they are still based on the same principle. Thermoelectric chillers are usually either in-line or devices mounted into the aquarium through bulkheads. The two most commonly seen thermoelectric chillers are the Coolworks IceProbe (below left) and the AZOO Thermoelectric Heater/Chiller (below right). If you have severe heat problems, you may need to look into getting a Freon or other refrigerant-based chiller. 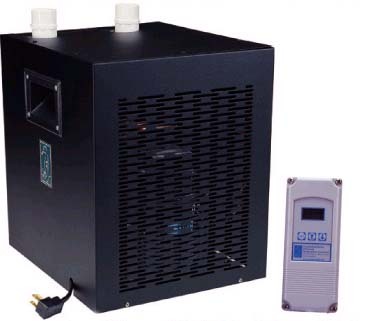 Liquid refrigerant-based chillers are extremely useful in decreasing the temperature of aquariums. The problem with these devices is that they are extremely expensive and use significant amounts of electricity. Liquid coolant chillers can be either "in-line," or a "drop-in coil" type. With an in-line chiller, water from the aquarium is pumped through it and returned to the aquarium or sump. 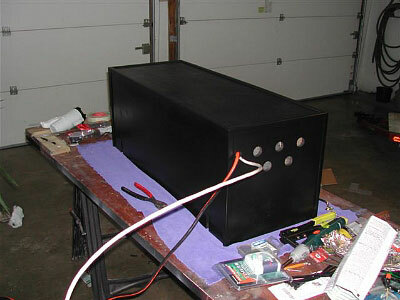 A drop-in coil has a metal coil (with lots of surface area) that is placed in the sump and cools the aquarium. Chillers range in sizes from around one-quarter horsepower to greater than 1 horsepower. Some liquid coolant chillers have other features like digital thermometers and heaters built in. Whenever one engages in a "do it yourself" (DIY) project, safety must be kept in mind at all times. Please be careful and logical when working with electricity, especially when it will be used around water! If you are unsure about something get advice from an expert or better yet, have an expert do it for you. Some fans have metal blades and do not come with any sort of cover or screen. Be careful not to put your fingers or other body parts into them. Also, if children could be around the aquarium, keep in mind the potential hazard created by sharp fan blades. Galvanized screen that can be used to cover the blades of some types of fans is available from hardware stores. Keep in mind that unless it is specifically stated in the product's literature, most fans aren't designed to get wet or be exposed to saltwater. Also keep in mind, saltwater is very conductive of electricity so proper grounding of electrical devices is essential. I use and recommend a ground fault circuit interrupter for all my aquarium devices. To summarize, marine aquariums are prone to heat problems due to powerful lighting and heat produced by other equipment like water pumps. 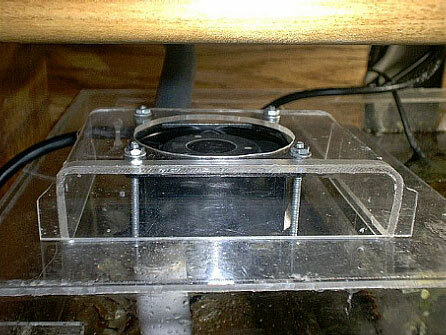 A tabletop fan can be aimed at a striplight to keep it cool and keep heat out of the aquarium. Glass tops create a mini greenhouse effect in the aquarium and keep water from evaporating, thus keeping heat within the aquarium. A possible substitute for a glass top is a fitted sheet of eggcrate which is available at most hardware stores. Small fans such as the kind used to cool computers can be mounted in a custom hood to either pull heat out or push cool air into it. Some fans, like those by Icecap, have sensors that vary their speed based on the temperature inside of the hood; the hotter the temperature, the faster the fan runs. Alternatively, lights can be put on a controller like a Ranco model that turns them off when the temperature rises to a preset point. When the temperature drops to another preset point, the controller turns the lighting back on. Thermoelectric chillers provide benefits similar to that of a liquid coolant based chiller at a much lower cost. These thermoelectric chillers, however, are not nearly as powerful as liquid coolant chillers, and in some cases are too weak to remove enough heat from the aquarium. 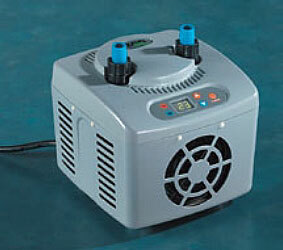 Liquid coolant chillers, although somewhat expensive, are the ultimate in aquarium heat remediation. These chillers use liquid coolants like Freon to counteract excess heat in an aquarium. If you are experiencing problems with heat in your marine aquarium, hopefully this article will give you some ideas on how to rectify them.